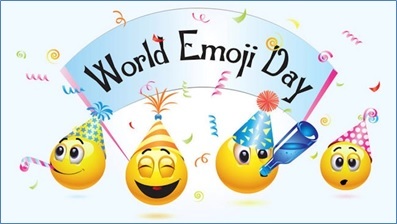 July 17th is World Emoji Day. Emoji, a Japanese expression, roughly means “picture word” and was developed in 1990 by Shigetaka Kurita. While working for NTT Docomo, a Japanese telecom company, Kurita design these picture words as a feature on their pagers to make them more appealing to teens. When Apple released the first iPhone in 2007, an emoji keyboard was embedded to nab the Japanese market. While not intended for U.S. users to find, they did and quickly figured out how to use it. Every year new emojis are developed. The emojipedia.org keeps track of all the emoji updates across all platforms and operating systems. There are over 1800 emojis covering much more than just emotions. From transportation, food, an assortment of wild and domesticated animals to social platforms, weather and bodily functions emojis virtually speak for themselves. 5. A group set a new record for dressing up in emoji costumes around the world. Dedicated fans gathered in cities like Dubai, Dublin, and Moscow to set a new Guinness Record for donning emoji-face costumes simultaneously in advance of World Emoji Day and the release of The Emoji Movie on July 28, 2017. What is popular in 2018 so far? One of the most requested this year is the addition of a white heart emoji. This would complement the 🖤 Black Heart of 2016 and the 🧡 Orange Heart of 2017. Other popular requests include more representation for people with disabilities, some previously-available smileys, and a frequent request: a version (or versions) of the family emoji with a dark skin tone. Statistics come from a range of sources including social media requests, emails, and search data. To see the full list, go to Top Emoji Requests for 2018. What is your favorite emoji? Do you have a request for a new one?